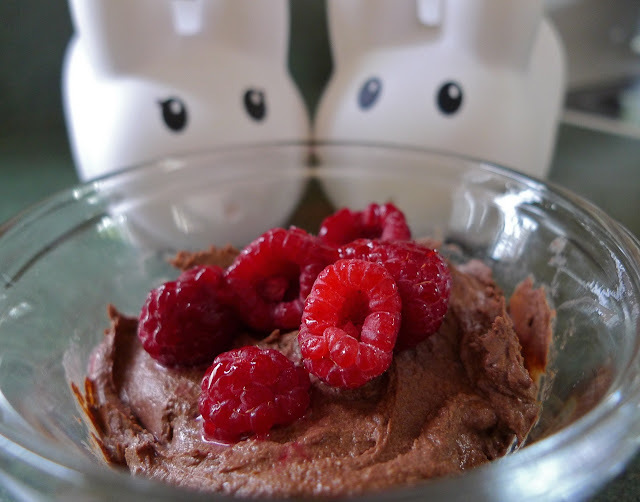 The labbits love chocolate and they love a quick dessert, so when Pipkin came across a recipe called "The World's Fastest Chocolate Mousse" he couldn't resist. Here's the secret: it's made with tofu! No eggs, no added milk or sugar, no thickening agents...just the loveliness that is tofu! You might be shaking your heads right now...pooh poohing the thought of bland, oddly textured, jiggly beige matter, but its - shall we say - tofuness, is the reason why it's great in this dessert. 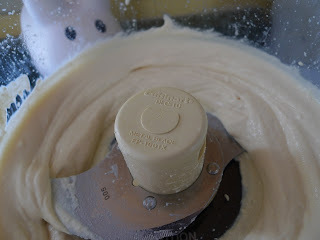 Tofu easily becomes a silky cream base in a food processor, and its tofuness is practically undetectable under the cover of bittersweet chocolate. 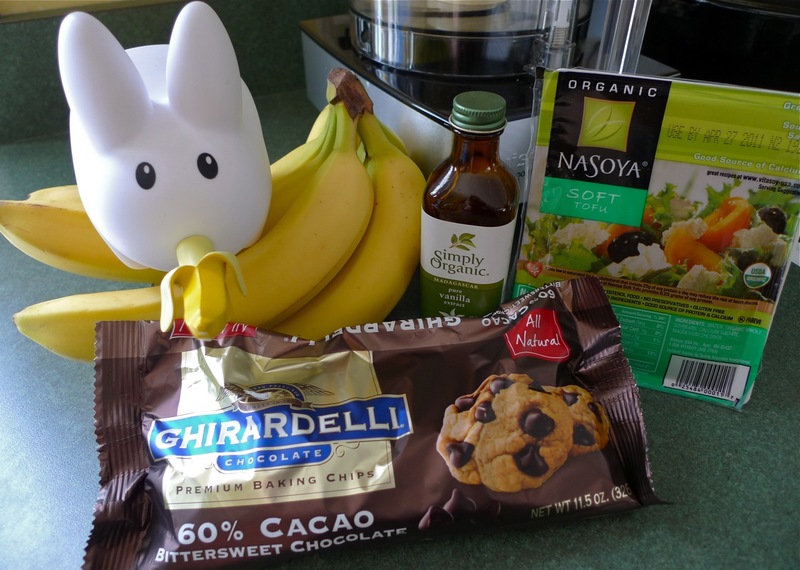 Since the labbits like bananas and always have plenty around, they decided to slice one up and add it to the mix. Clover, always one to accessorize, added raspberries as a garnish. So break out your food processor (or blender, or hand mixer!) and whip up this quick dessert. Consider adding in peanut butter, or substituting in almond extract or white chocolate. Top it off with fruit, nuts, shaved chocolate, or whatever you like. Most importantly, don't tell your tofu averse friends it's made with tofu until they've licked their bowls clean. You might just change their minds about tofu! Print the recipe here. Melt chocolate in a stainless steel bowl set in a pot of simmering water on low heat. Chocolate can burn easily so don't cheat by turning up the heat. 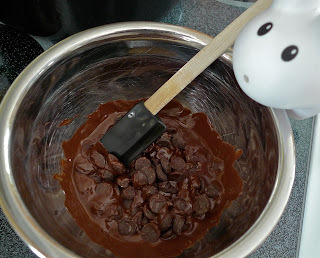 Low and slow...stir frequently until the chocolate is smooth. Place the tofu in a food processor and puree until smooth. So tempting to eat like this! 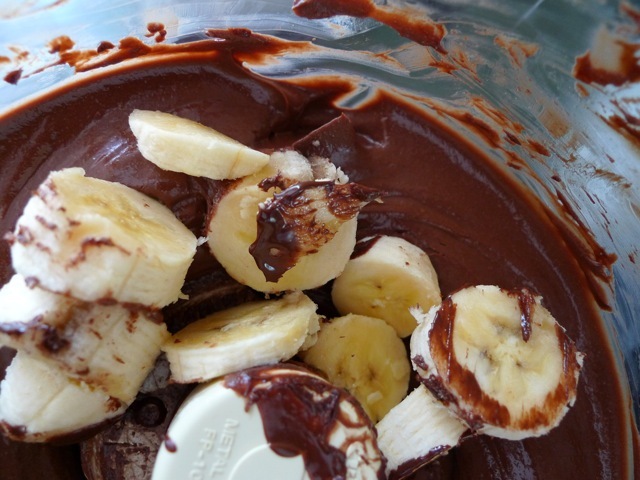 Add melted chocolate, vanilla extract and sliced banana and puree again until smooth, being sure to stop and scrape down the sides with a spatula. Pour into serving dishes, top with raspberries and chill until ready to serve. Just made this tonight, so yum! I found the chocolate overpowering at first, but after a couple hours in the refrigerator the banana taste matured and made a good balance. I think next time I will increase the amount of tofu to chocolate, not that anyone could tell it was made of tofu! Chocolate can't ever be overpowering! Hehehe. What kind of chocolate did you use? I used bittersweet chocolate squares, Baker's brand. I've made it a few times since and upped the tofu by 50% and was about 5 seconds away each time from dying from eating too much. You really have to be a chocolate lover for this one (which I am, ohhhhh I am - but Rolf and the Campbells are not, boo).